Call of Duty in space; not many expected that 10 years ago. And yet here we are, breaking the shackles of Earth in typical bombastic fashion. Actually, the space setting is not a big surprise if you played the last few games in the franchise. Advanced Warfare and Black Ops 3 pushed into the future with exo-suits, robot soldiers, and jet packs. Even Ghosts, the previous title from developers Infinity Ward, had a brief mission in Earth's orbit. 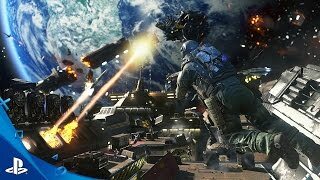 Infinite Warfare takes place much further into the future; humans have colonized planets and moons across the Solar System—they even have space vessels capable of faster than light travel. 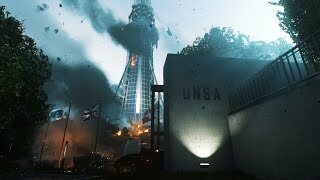 While this futuristic space setting brings interesting vistas to the multiplayer maps, the online action retreads last year's successful formula. The campaign meanwhile undergoes a more extravagant change and is one of the best in the series. War never changes because, despite the technical knowledge to collect resources from other worlds and create artificial gravity, we still desire to kill each other. Mars hates Earth—the Red Planet is home to the Settlement Defense Front (SDF) and they strive to halt resources and do us harm for unknown reasons. Luckily, Earth has some big space guns that keep them from knocking down the doors; nothing could go wrong with those, right? Players assume the role of Nick Reyes, a space fighter-pilot that ends up commanding the spaceship Retribution after those space guns are compromised. Much of the fleet is destroyed and you become fighter-pilot, captain, and boots-on-ground soldier. After the introductory chaos on Earth, players will undertake missions across the Solar System by selecting them on a map at the helm of their new spaceship. The Retribution is more than a staging area, it behaves like a modern-day aircraft carrier and its exterior views change as you progress through the story. The writer behind this space opera, Brian Bloom, also voices and acts strongly in the main role. It is a slick narrative, with a broad cast of likable characters and sharp dialogue. It is a shame that the antagonist Salen Kotch (played by TV's Kit Harington) is wasted, and ridiculous character deaths become routine. The main campaign missions are where the game excels. Each one offers brisk, well-controlled and exciting action pieces. The campaign regularly pushes the player forward with urgency and tight game spaces. Players will visit an interplanetary terminal on the Moon and can shoot windows to expel enemies. Later, they will navigate the hostile landscapes on Titan (Saturn's moon) and utilize stealth in the dense atmosphere before flying a nimble spacecraft over oceans full of ethane. Each mission takes the intricate control of the franchise and mixes it with the space genre to produce something of a revelation. Excellent detail and competent shooting gameplay are found throughout. Before each mission, players can select their loadout from any previously used weapon. During missions themselves, animated briefings on the HUD provide invaluable context. And when the action begins, wall-running and jetpack boosting is used naturally, just like the anti-gravity grenades that bring foes out of cover. Although this is a linear shooter, the campaign does allow some flanking and friendly soldiers will reposition appropriately. Finally, when you complete a mission, news reports summarize events, the ship's logs are updated, and characters will comment as you return to the helm. Optional side missions are broken into two groups: infiltrations and space combat. They serve to give players variety and can be completed immediately, in any order, or dispersed throughout the campaign at your discretion. Space combat missions put players in a jet-like spacecraft with plenty of movement freedom. The objective is usually to eliminate a swarm of fighters and then obliterate larger Destroyer vessels. The action is frantic. Players will need to navigate around asteroids, or space junk, using slightly bizarre momentum systems. Although the scale of these ship battles is odd (the arenas are too small and lack detail) they are still rather entertaining and concise. Infiltrations are a longer and more traditional Call of Duty experience, taking place mostly down the corridors inside SDF spaceships. Some missions feature microgravity, including hiding behind floating debris, clambering over the hull of large ships, or venting compartments full of enemies. Others have optional stealth as you try to rescue hostages or wear a disguise to walk freely through enemy patrols. By the final infiltration mission, it will be obvious that they share the same levels. The missile storage room is reused a few times, and the same is true for the main corridor. Thematically this makes sense and fortunately missions approach the locations from different directions under altered circumstances. The campaign is a cohesive package and quite captivating for its entirety. The biggest disappointment is that it spirals to a conclusion after no time at all. And yet, at 8 hours long, it is longer than most Call of Duty campaigns. The reason it feels short is probably because there are only a few main missions. It is still a great campaign while it lasts and may be worth replaying on harder difficulty. Zombies is a Call of Duty staple by now and Infinite Warfare offers a fun ride. The setup is similar to before; four players are thrown into a different world and must defend against waves of zombies while they collect items and buy weapons. This time, that world is a "Spaceland" theme park set in the 1980s that features some great music from the era. Straight away it is clear that Spaceland makes an effort to inform the player what they need to do via a map and audio/visual hints, trying to avoid the occasional confusion that was found in Black Ops 3. Players need to restore power to each section of the park. It takes much less time to actually start delving deeper into the level. And the park layout is great, with open areas and liberating straights that allow for pleasant zombie killing. Zombies in Spaceland offers a bunch of smart mechanics. A special Afterlife Arcade mode activates when a player dies, transporting them into a small area where they must complete basic arcade games to rejoin the others. Living players do their best to survive by running away from zombie hordes (grenades help) long enough for their friends to return. This creates long, high-intensity sections that are fun even if no progress is being made. Numerous rides and interactive objects can be used against zombie hordes; turn on a space shuttle engine to scorch them, or guide them to a vortex ride and watch them be sucked into the air. You can even use teleporters and return to token machines that reward you with a boom box that makes zombies dance or a sentry gun that makes their entrails dance. Players start running in circles, towing behind them a sizable zombie horde, and occasionally crossing each other's paths, which can end in disaster or hilarious intensity. Long sessions in Spaceland felt brief, which is a good indication of how much fun it is. While Zombies is a great online mode, multiplayer is the place to go if you want to shoot other players in the face, in space. Online action features the expected 6 vs 6 matches, scorestreaks, perks, and a pick-10 system. Wall-running and boost jumping returns largely unchanged from Black Ops 3 and the maps could slot into that game without issue. Some maps have overt wall-running channels, while others are more traditional with less obvious side routes. The movement still affords similar flanking opportunities and hilarious moments in the air. One of the obvious traits of the new maps is the visual clutter. The maps are perhaps too detailed with animated machinery and superfluous objects near busy areas that hinders target acquisition and navigation. Mayday is a good looking map, set on a damaged spaceship falling into a black hole, but its bulkheads have too many features and the moving debris distracts. But there are still some clean maps that are pleasing from the get-go; Frost and Frontier both have white aesthetics that allow for quicker target acquisition and their layouts are quickly understood. All maps look good with attractive skyboxes, and the extra detail won't pose a problem after a while, but initial impressions can be grating. While there are good-sized maps with longish action channels, there are several maze-like levels that encourage akimbo or rapid-fire weapons and the relevant high-speed perks. On these maps, using long range weapons requires extreme commitment to the task as you must take up position in corners. In general, across all maps, there was a tendency to equip speed-enhancing perks and attachments. And it is hard to resist the run-and-gun approach when it can be rather enjoyable. Much like the Specialists in Black Ops 3, a Rig system gives players a Payload and Trait to go along with their standard loadout. Each of the six Rigs have three different Payloads that recharge over time and are like Specialist abilities—they might provide a powerful weapon for a short time or a rewind skill that gets you out of trouble. While Payload abilities are strong they still tend to take a backseat to the shooting action due to their brevity. Traits are new and generally act as passive abilities that are similar to perks. One Trait highlights enemies taking damage; another resupplies grenades from dead enemies. Although the Rigs don't have the personality of Specialists, they offer decent combinations and similar gameplay. Most deaths will come from standard weapons or equipment that all Rigs can use. The options are similar to its predecessors, even down to their individual look. Energy weapons function like their ballistic cousins, but their projectiles will bounce off walls for reduced damage. Weapon variants expand the options further by enhancing the base models with additional perks that may increase ammunition, fire rate, or accuracy. Acquiring high-tier variants takes far too long, as you must hope to randomly find them in crates or craft them with limited resources. Outside the primary guns there is an awesome black hole grenade that will draw enemies to its location and a tactical dome shield that protects for a short time. Scorestreaks are fairly subdued but still useful; the remote-controlled self-detonating scarab typically only provided one kill but was fun to use. The shooting aspects are solid, with some neat thematic changes, but unfortunately the crate and weapon variant system is a drag. So Zombies is fun and multiplayer is decent, but the player base on PC is small. At least Zombies can be played alone and there is the ability to play multiplayer against bots. 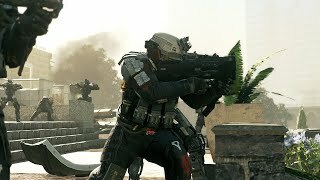 There should be enough real players for a TDM game in most regions but the series continues to lose favour on the platform either because of yearly-release fatigue, futuristic setting, technical issues, competition, or lack of PC-centric features. The game does have reasonable performance, but it still has many of the same issues as its forebears. Matchmaking has problems—what a surprise—as players are kicked from lobbies or hosts fail to migrate. Some matches began with just two players despite launching with twelve. Ping is represented by four ambiguous bars and even when one player was warping, so much that he could barely be killed, he still had the full bars. Basic anti-cheat seems to be absent, as the same player continued to aimbot a week after he was first reported. Combine these issues with the struggling population and multiplayer is hard to endorse on PC. It has been a long time since I could recommend a Call of Duty game based solely on its campaign but Infinite Warfare breaks the trend. The campaign is invigorating. It mixes the space setting with the brisk and controlled shooting action for which the series is known. There is good diversity across the primary missions as players jump from Earth's moon to Saturn's moon for equally amazing sequences. If only the campaign was longer. Zombies mode is a lot of fun; tumbling through a theme park, turning on show rides that decimate undead hordes, is a good way to kill time. Multiplayer is probably the weakest link, despite it being fairly close to the action from last year. Maps get better in time but nagging online issues, waning populations, and weapon variants negate some of the fun. Nevertheless, Call of Duty: Infinite Warfare will provide a varied and precise journey through our Solar System in one of the most enthralling campaigns in the franchise so far. Space vistas look quite good and the engine is used cleverly. Character models look great. Sound is good, and music is epic. Dogfighting and boots-on-ground work seamlessly as you dictate proceedings from the helm of a spaceship. Wall running and boosting is used well. One of the best campaigns in the series with fantastic main missions and great thematic changes. Campaign offers about eight hours of a space opera that could have been much longer. Maps are a bit scratchy, but they get better in time. Gameplay is similar to last year which is not a bad thing. Zombies mode is fun and well designed. Player base is not high on PC. Performance was solid on the test machine, with no major problems. There were a few multiplayer issues with lobbies and networking. With an amazing space campaign and a frenetic Zombies mode, Call of Duty: Infinite Warfare is worth the fuel needed to reach orbit.